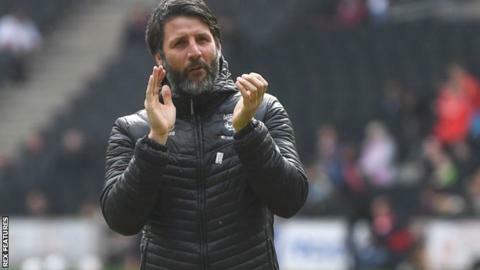 Lincoln City boss Daniel Cowley has said he wants the club to secure promotion at home to thank the club's "unbelievable" supporters. The Imps will be promoted to League One on Saturday if they beat Cheltenham at Sincil Bank. "We'd like to do it in front of our fans," he told BBC Radio Lincolnshire. "They've been unbelievable since day dot and the success we've had has never been about 11 people. We'd love to be able to give them something back." He added: "It's been a county, a city and a club effort, so we feel a responsibility to do it for them." Lincoln, who are looking to break a club record 18-match unbeaten run in the Football League against the Robins, will be the first team to secure promotion in the EFL this season if they beat the Gloucestershire side. Cowley led the Imps to the National League title in 2017 and said taking them up to League One would be "pretty special". "If we can do it then collectively we can feel really proud," he said. "We always plan to be successful but we know that the higher up the leagues you go the tougher it is, so if we can achieve it it will be the biggest and best of my career."